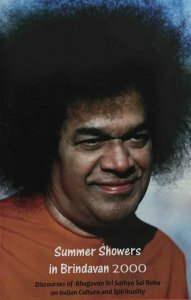 Bhagawan Sri Sathya Sai Baba had graciously delivered 15 discourses during this course. Bhagawan Sri Sathya Sai Baba had graciously delivered 15 discourses during May 2000, the 75th year of His Advent. The students and other participants were fortunate to hear from Bhagawan on the importance of five elements, Pancha Kosas, sacredness of the human body, the concept of Dharma, material and spiritual outlooks, how to become dear to God, the importance of chanting the divine name and the like.